I sit in a darkened school atrium. It isn't the first time I have been here and will not likely be the last. I sit in awe and admiration as a group of junior high students bring to life a musical in all its glorious complexity. 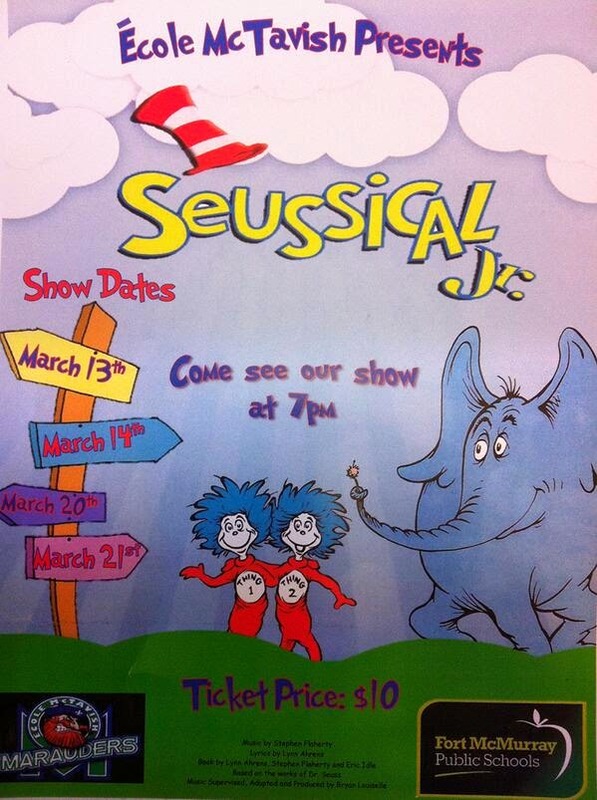 I watch as the opening night of Seussical Jr. unfolds at Ecole McTavish, and once again I am amazed. This is the Intrepid Junior Blogger`s final year in Junior High. I have now watched her on that stage a few times, and every time I am reminded not only of how proud I am of her but of all the students who spend hours on these performances. As a parent I know it is a huge commitment of time and effort, all while the students must maintain their academic performance, attend to other activities and maybe even have time for a video game or two. Last night the cast and crew of Seussical Jr. took us on a romp through the jungle and a circus. We met some amazing characters along the way, and I was blown away by the talent coming out of a junior high. From The Cat in the Hat to Jojo to Horton to Mayzie to Gertude, the performances were of excellent calibre, and these young people can only get better. The supporting cast, the Whos and the inhabitants of the Jungle of Nool and The Grinch and the Kangaroos and the Bird Girls and all the rest completed an ensemble that made magic happen in a school atrium. It was, without a shadow of a doubt, a resounding success. 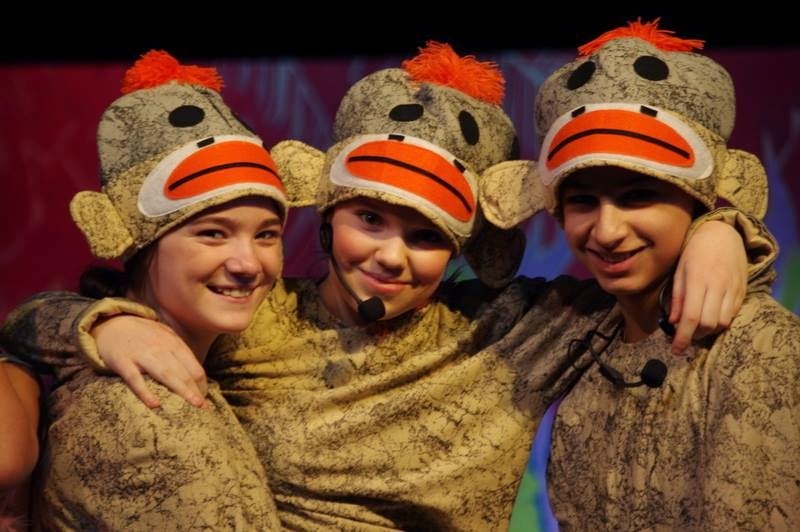 And I have not forgotten the Wickersham Brothers, a trio of monkeys of which my own monkey was the smallest, often the monkey in the middle between the other two mischievous monkeys. The three of them did a stellar job of monkeying around, and the littlest one often had a sly expression on it`s face that I know very, very well. To say I enjoyed last night is an understatement. The world of Seuss has always been one of fantasy and pure joy, but there are lessons hidden in the stories, too, ones of which we can always use reminding. I was reminded about the value of following your own heart, the importance of staying resolute in the face of adversity and the ability of a bunch of junior high students to create another universe, if only for a couple of hours. It wasn`t my role or duty as a parent to be there. It was my honour and privilege. 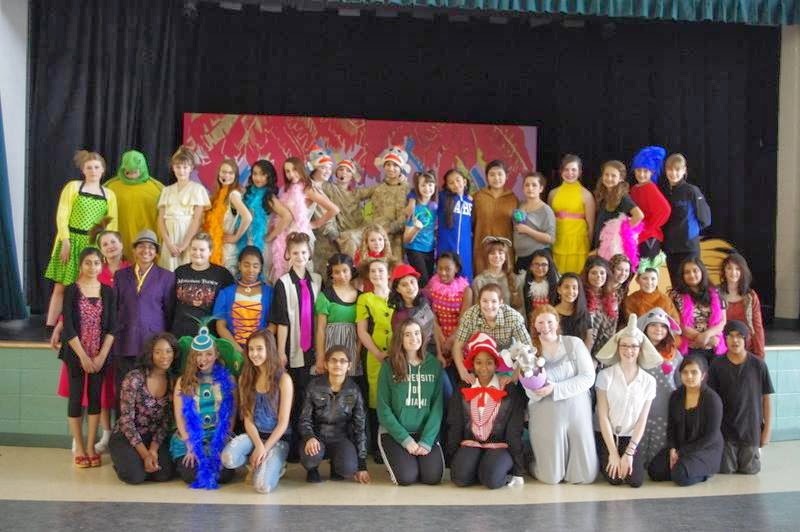 To the cast, crew and staff at Ecole McTavish who created this performance I want to say congratulations. You earned the standing ovation you received, and I believe many of you will see many more of those ovations in your careers on the stage there and in future adventures. I want to thank you for all your hard work, because I know you worked so hard, and I want to tell you that it is appreciated. There is a lot of talk about the future of the arts in our community, and of events like interPLAY. If you want to see our future, our potential and the reason we need to ensure the arts scene here is vibrant and strong then I suggest you head to see one of the three remaining shows of Seussical Jr. Our future will parade in front of you on the stage, dancing and singing and acting and showing us the value and importance of the arts. This is the future of our arts, and our community. What a privilege it is to sit in front of them in a darkened atrium and cheer them on as they lead us into that future, one dance step and song at a time.